The art of bookbinding, which spread from Central Asia to Iran, the Arabian Peninsula and Anatolia, was characterized by the motifs of the regions in which the artists grew up. 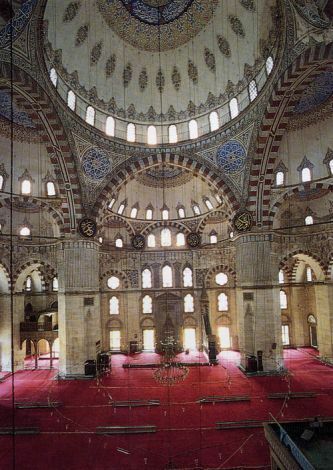 Various styles were born employing Hatayi, arabesque, Herat, Rumi, Seljuk, Mamluk, Ottoman and Moroccan motifs. Ever since the invention of reading and writing, protective covers either of thin boards or, more often, of leather have been made to protect books and to keep their pages in order without bending. With the increasing use of leather for this purpose, the practice developed into an art known as cild (Arabic for leather or hide), otherwise known as the art of bookbinding. Spreading first in Central Asia and China and then throughout the world, this art rose to a profession and a livelihood among the Uighur Turks. The binding of sacred texts and documents and later of books of all kinds, and the subsequent decoration of such bindings commensurate with the value of the works they contained became a widespread practice. As the art of calligraphy developed in parallel with the Islamic religion, texts of important religious works, particularly of the Koran, proliferated. These were protected by bindings that maintained a degree of refinement, beauty and elegance, evolving concomitantly with other Islamic art forms, and achieving a level worthy of the high value of the books they contained. The upper and lower covers: This forms the cover that contains the text of the book. Both the upper and the lower parts and sometimes the inside as well displays decorations. The spine of the book: This is the part that covers the place where the sheets are bound together. The bookflap: This is the flap, usually triangular, that covers the front of the book. It can also be used as a bookmark by the reader. The fore-edge flap: This connects the bookflap to the rest of the binding and protects the front of the book. Before the production of cardboard became widespread, covers for handwritten books were made by gluing thin pieces of leather to papers that had been stuck together in layers to form something like cardboard. If decorative motifs were applied on these by hand, they were known as "Yekiah" or hand-wrought bindings. If the decorations were applied by pressing forms in a mould, they were known as inset bindings, and if the four edges of the cover were covered in cloth or watered silk with peripheral leather, this was known as "Çınar küşe" binding. If the entire binding consisted of marbled paper, this was known as "Ebru" or marbled binding, while bindings covered in velvet were called "Zerduva" binding. Bindings worked in gold or silver thread were known as "Zerduz" and "Simduz" respectively. If the binding consisted of lacquer applied on cardboard, it was known as lacquered binding. Finally, bindings decorated with a reticulated square or rectangular designs at the four corners was called "Zilbahar". The sun-like round or oval motif generally in the center of the upper or lower covers on the flap was called the "Şemse" (sun in Arabic). The smaller ovals, sometimes adjacent to it, were called "Şalbek" or pendants, and the motifs at the four corners of the cover were known as "Köşebend". All these motifs were enclosed inside a border known as "Zencirek" because it resembled a chain (zincir). Leather bindings displaying a central "Şemse" rosette were known as "Şemse Cild", and were the most ornamental of all the bindings done in the classical style. They had different names depending on how they were produced. Alttan ayırma şemse: The şemse motifs imprinted on the leather cover are in leather color and the background is either gilded or wrought in gold. Üstten ayırma şemse: The background is leather and the motifs are applied in gold leaf. Soğuk şemse: Plain, leather color motifs without decoration. Mülemma şemse: Both motifs and background are completely decorated with gilding. Mülevven şemse: The şemse is in leather of another color. The term means "colored". Müşebbek şemse: The motifs are cut and carved out of leather and glued on to give the illusion of depth. While there are certain similarities between classical Turkish bindings and the bindings of western books, they are quite different in detail. Turkish bindings, for example, are the same size as the book itself and do not extend over the edge. They are stitched in the sewing style known as "Book Şiraze", which uses colored silken threads. Turkish bindings also include a book flap which, together with the fore-edge flap, protects the edges of the pages and can be used as a bookmark. The decoration of the binding with the corner motifs, central panel stamp and chain-like border also lends them a certain elegance. Vassale: This is a repair done by adding around the edges paper or leather of the same kind as that used originally. Akkase: This is the technique of tinting the pages of the book one color in the center and a different color at the margin. Zahriye: This is the frontispiece or first page of the book inside the cover. It is usually of a different color and thickness from the pages of the text. Sometimes it also contains interesting observations, verses, or birth and death dates not included in the text itself. Katıa: This is the Turkish art of filograms (paper or leather filigree), which reached extraordinary heights in the 15th and 16th centuries and resulted in the production of masterpieces, particularly among doublures. Bursalı Fahri and the kat'ı masters who came after him produced many priceless works.